I am a scarf aficionado. I don’t know why these little squares of silk so intrigue and entrance me, but they do. It’s a rare day that I don’t wear one. I buy them randomly when I see one I like. But when I decided to start collecting Hermès scarves, I was more strategic. I looked through the current and vintage canon to pick out the ones that appealed to me. To tell you the truth, there were only a handful that went on my Must Find. Must Buy list. Even though I have a very vintage wardrobe, I have a very modern sensibility. So, rather than the traditional and equestrian motifs that the House of Hermès is built upon, I chose more idiosyncratic and contemporary designs with a certain sense of fun, humour, whimsy, and charm. As well as some very modernist geometrics. If you are not familiar with the venerable history of the Hermès scarf, known in French as the carré, or square, suffice it to say, it is legendary. 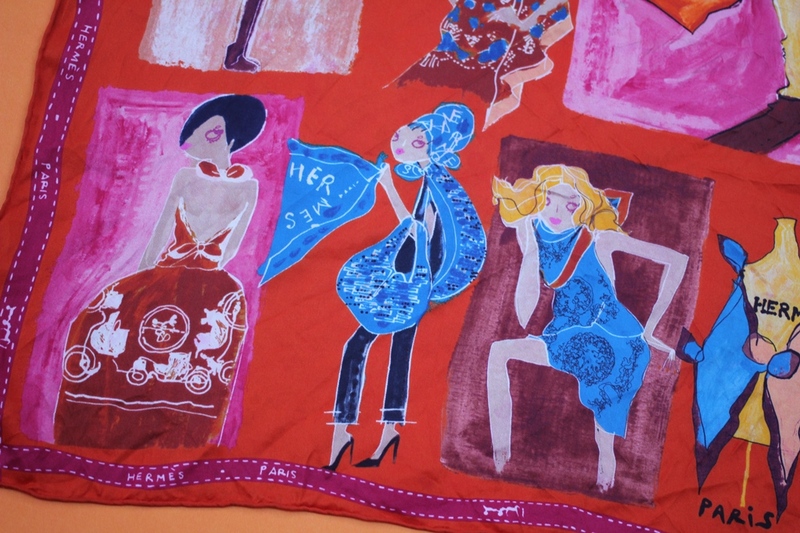 The silk scarf debuted in 1937 and since then, over 2,000 elaborate patterns by more that 150 artists have been produced. It is purported that one is sold every 25 seconds, all over the world. Each silk creation has a title and is designed and signed by an independent artist. Furthermore, each design is produced in different colourway which is hand-silk-screened by a person, not a machine. Each individual colour requires a separate silk-screen and one scarf has an average of 27 distinct colours. So I had to not only to decide which patterns I loved and wanted to collect, but also select a colour it is offered in. 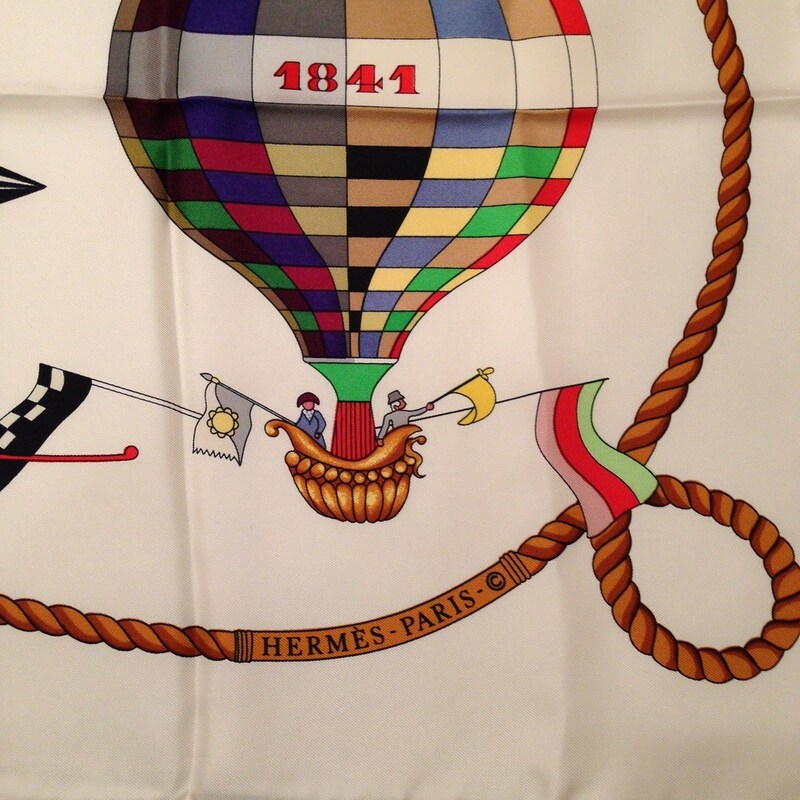 My first Hermès scarf purchase was J’AIME MON CARRÉ (I Love My Scarf). Although I initially decided upon the black/gold colourway, I simply could not find it, so, I bought the red one instead. Not giving up though, I put an alert on eBay in the hopes that the other one would eventually come up for sale. In the meantime, I discovered that the black version was difficult to find because not only was the J’aime Mon Carré collection limited edition, but that particular colourway was rare. And so, I watched many pretty scarves came and go online, but it took 2 years of watching and waiting until I found the one I was looking for. Isn’t Patience one of the virtues? It should be. The seller was in Germany and I was able to negotiate on the price. The ribbon-tied orange box arrived just after Christmas and the scarf inside was in pristine, unworn condition. I sold the orange-ish red J’aime Mon Carré on my eBay account and am delighted with my golden girls. They are a more subtle rendition of Keng Saw’s wonderful and stylish Parisian characters, and the classic black and camel colour combination fits right in to my black-centric wardrobe. Gold jewellery and gold handbag hardware make a great counterpoint to this scarf and it takes centre stage with a beige monochrome look. The scarf switcheroo was ultimately a bit of sartorial fine tuning. Sometimes it’s good to experiment, take some fashion risks, try new things, take a move outside your comfort zone, and see what happens. What a beautiful collection you have and I love the new one you purchased. Such a beautiful collection, love all of these stunning patterns.